Marijuana-infused products brand introduces raspberry and grape to 2018 limited edition sports-inspired gummies line. 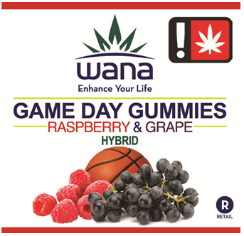 Portland, Ore. – As Portland basketball fans root for the hometown team, Wana Brands offers 2018 basketball-themed Game Day Gummies in limited-edition raspberry and grape flavored gummies. The delicious flavor combination of raspberry and grape is a tribute to the red and black colors of Portland’s hometown basketball team. Made from an original recipe, handcrafted and infused with tincture in the cooking process, the Portland basketball-themed gummies are an extension of Wana Brands’ Sour Gummies. The basketball-themed gummies are available for purchase in Oregon adult-use dispensaries throughout the 2018 basketball season. “At Wana Brands, we’re constantly looking for innovative ways for our customers to enhance their lives,” said Nancy Whiteman, co-owner, Wana Brands. In addition to being available in nearly 85 percent of Oregon’s dispensaries, Wana Brands leads the edibles market in the United States, owning 20 percent of the highly competitive Colorado market, according to BDS Analytics’ October 2017 report. The popular products are available in 75 percent of Nevada dispensaries, and are now available in Arizona as well. Wana Brands is projecting expansion into Illinois, Florida, Maryland, Pennsylvania and California, as well as internationally in Canada, in the coming year. With a wide range of items, spanning from sweet to sour, Wana Brands offers its customers a variety in choice and consistency in quality. Wana Brands has invested in refining its proprietary edibles recipes so that the taste of the company’s delicious ingredients come through—not the taste of medicine—producing artisan level products that are infused—not sprayed—and have undergone rigorous internal and external testing to ensure precise dosage and consistency.